Dentures are a traditional way of replacing missing teeth or tissue around the gum. Two kinds of dentures exist: Complete and Partial. Complete dentures are considered either conventional or immediate. The process of making complete dentures begins after the teeth have been removed from the mouth and the gum tissue has begun to heal. Placement usually takes place two to three months after removal of teeth. Immediate dentures are made in advance of the removal of teeth and can be placed as soon as the process takes place. 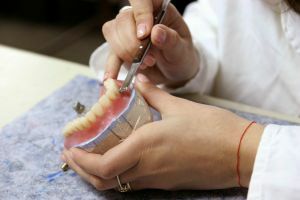 Because the bones and gums shrink during healing, adjustments are typically required while the healing process takes place and immediate dentures are used mainly as a precursor to complete dentures. Partial dentures are typically made from a plastic base with replacement teeth attached. They are sometimes attached with a metal framework or a cemented bridge. Partial dentures are used to not only fill spaces from teeth that have been removed, but also to keep other teeth from changing position.